As you probably know I am a huge fan of herbal teas. I probably drink 2-3 cups of tea a day and sometimes they're all different herbs! 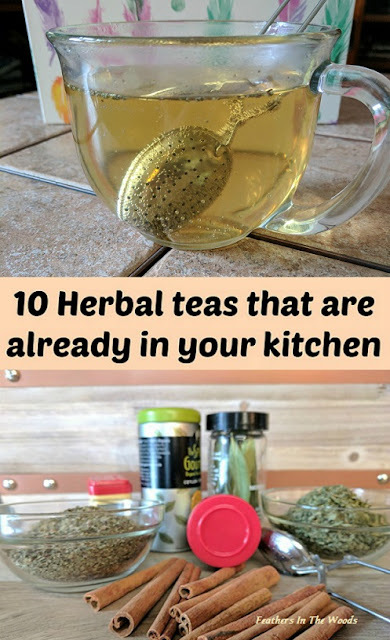 Lately several people have told me that they really want to start using herbal teas to improve their health but they don't know where to start. They don’t know where to get herbs or which ones to use, and they certainly don’t want to invest money in something new that they might not continue with. I completely understand that problem. Ordering a bunch of herbs and supplies can get expensive and it's probably unnecessary! Getting started with herbal teas is as easy as raiding your kitchen! I've made a list of 10 different herbs that are probably lurking in your spice cabinet right now. I'm sure you have Basil in your kitchen. Many people have Turmeric. You probably have Cinnamon too. These herbs and more have some amazing qualities that you can unlock by preparing them as teas. I've included their most popular herbal uses, and even wrote out the instructions to use them and it's all in one convenient download. You can even print it out if you'd like! This was going to be a mini e-book, but I decided to give it away instead. That's right, free! All you have to do to get 10 Herbal teas that are already in your kitchen is sign up for our emails below and the link will be sent to you. Oh...since you're getting my newsletter, I'll also send the link to the 2 page printable list: The beginners guide to herbal bath blends...38 ingredients to mix and match from. Everything from herbs and flowers to salts, milk, oils and more. If you can put it in the bathtub, it's on the list along with which ailments each ingredient will help you with! I hope you enjoy your downloads! What a smart idea! I'm always buying new herbal teas, but it makes so much more sense just to make my own! Thanks for linking up at The Pretty Pintastic Party! Great idea! I love herbal teas. Thanks for sharing with us at #OvertheMoon Link Up. Great idea! Herbal teas are so wonderful!